Do I need to pay Ryanair checked baggage fee separately on the return trip? I've paid the checked baggage fee at the airport on the outbound trip. The Ryanair Android app doesn't tell me anywhere whether I can bring a checked bag on the return trip. Do I have to pay again? Can't seem to find this information clearly stated anywhere on their website. 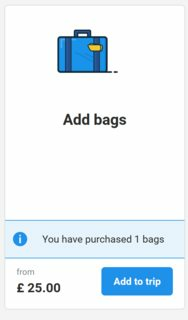 Note "You have purchased one bag"; given that this is the button I click to add a bag to the return trip, this text very much seems to imply that I don't need to pay again. Or do I? Yes. Baggage fees are always per check-in. It is valid for multiple legs when you fly them in sequence, but when you get your baggage back, you're done, and next check-in costs again. Not the answer you're looking for? Browse other questions tagged uk fees-and-charges ryanair or ask your own question. Is the Ikea Upptäcka bag accepted as cabin baggage on Ryanair flights? Bari BRI to Rome Fiumicino FCO Ryanair On Time Peformance - Is this doable? Does Ryanair charge the boarding pass reprint fee in practice? Where can I pay for the Extra Bag on the American Airlines Site? Are travel agents required to pass on any phone calls they receive from the airline?